The EU’s General Data Protection Regulation (GDPR) goes into effect on May 25, putting into place new data privacy regulations that corporations will have to adhere to when dealing with data of users in EU. While companies are not obligated to extend the new data privacy regulations to users worldwide, Microsoft recently announced that it will uphold the GDPR privacy rights for all of its users, irrespective of their location. “We’ve been advocating for national privacy legislation in the United States since 2005. We’re encouraged that some other tech companies are starting to endorse the need to address this issue as well. While debate about how to protect data privacy continues in the U.S., we’re committed to moving forward now to take concrete steps to help strengthen people’s privacy protection. Along with extending GDPR rights to all users worldwide, Microsoft has also updated its privacy statement to reflect its decision. The move is rather significant for Microsoft, which has been criticized in the past for collecting telemetry data from Windows 10 users (as seen below). 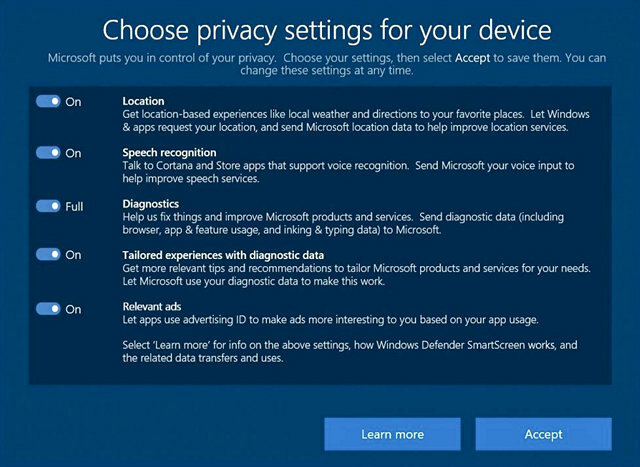 As the new privacy rights go into effect, Microsoft has made major changes in the way it handles customer data and has given more control to Windows 10 users over the collected data. It’s worth noting that Facebook’s CEO Mark Zuckerberg also made a similar statement, claiming that the social media platform would extend GDPR’s privacy rights to users worldwide. However, it was later revealed that the company was making changes to its policies to keep the new features away from users outside of the EU.